A well-trained dog knows how to walk on a leash without tugging on your arms. A dog bouncing off the end of the leash like a kangaroo may be amusing to look at, but no fun if you’re the one holding the other end of the leash. Dogs pull because they’re more interested in the sights and scents around them than in you. Your job is to train your dog to be aware of and respect your existence at the other end of the leash. Attach the leash to the live ring of the training collar. Put the loop of the leash over the thumb of your right hand and make a fist. As a safety precaution, don’t put your entire hand through the loop of the leash or wrap it around your hand. If your dog catches you unaware and makes a dash, he could cause you to fall. By having the loop over your thumb, you can just let go, and it’ll slide off. Place your left hand directly under your right, holding the leash in both hands as though it were a baseball bat. 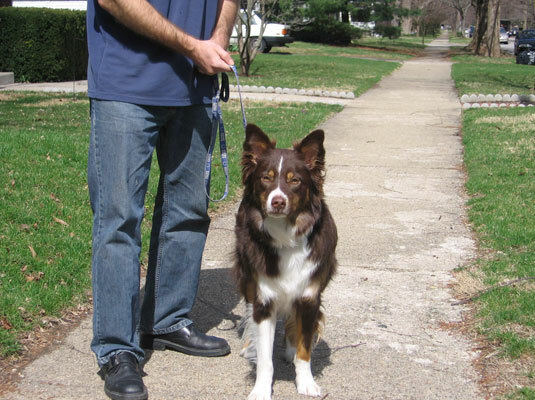 Holding the leash firmly in the correct position helps your dog get the no-pulling concept. Plant both hands firmly against your belt buckle. Say, “Let’s go,” and start walking. Just before he gets to the end of the leash, say your dog’s name and “easy,” make an about-turn to your right, and walk in the opposite direction. The way you’re holding the leash produces a tug on your dog’s collar and turns him in the new direction. Make your turn with determination and keep your hands firmly planted against your belt buckle. Turn and keep walking in the new direction. Don’t look back, and don’t worry about your pup; he’ll quickly catch up. As your pup scampers to catch up with you, tell him what a clever boy he is, and give him a treat. Before you know it, he’ll be ahead of you again, and you’ll have to repeat the procedure. The first few times you try this, you’ll be a little late — your dog is already leaning into his collar. Try it again. Concentrate on your pooch and anticipate when you have to make the turn. Always give Fido a chance to respond by saying, “Fido, easy” before you make the turn. You need to repeat this sequence several times over the course of a few training sessions until your dog understands that you don’t want him to pull. Your goal is to teach him to walk within the perimeter of his leash without pulling. Most dogs quickly learn to respect the leash, and, with an occasional reminder, they become a pleasure to take for a walk. If your dog seems particularly dense about walking without pulling, you may need to use a pinch or prong collar — the type that looks like an instrument of torture but is recommended by vets as the safest training collar. Your goal is to put your dog in a position where you can praise him, and if he ignores the training collar, you’re more likely to utter harsh words.